In 1947 the Junior League of Milwaukee funded, organized, and opened a blood center to deliver blood from donors to patients. 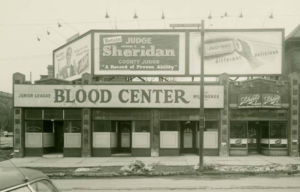 By 1949 the Junior League of Milwaukee Blood Center was located at 923 W. Wells Street on what is currently the Wisconsin Club grounds. The BloodCenter of Wisconsin currently provides more than 230,000 units of blood to 56 hospitals in 29 counties, annually. It also investigates health treatments and conducts scientific research. In 2015, the BloodCenter of Wisconsin joined Versiti, a strategic affiliation of regional blood centers in Wisconsin, Michigan, Illinois, and Indiana to share research and resources across nearby communities served. Our partnership with the BloodCenter of Wisconsin remains strong. The new member class of the Junior League of Milwaukee held our annual blood drive on Saturday, January 12th. We are proud to report we surpassed our sign-up goal, receiving 50 sign-ups and 44 successful donors. If you were unable to join us, we hope you will visit your local BloodCenter location soon, and keep our drive in mind next winter. We are proud to have served the Greater Milwaukee area for more than a century!